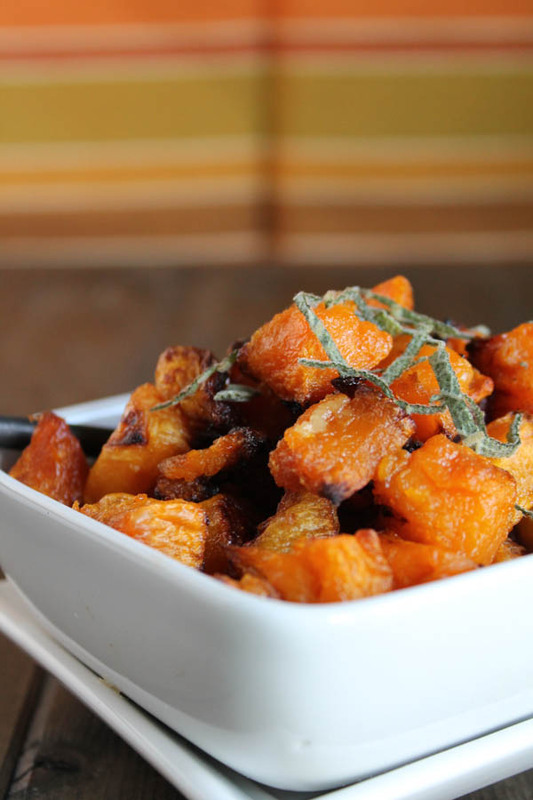 A quick and delicious way to enjoy one of fall and winter’s BEST veggies: butternut squash! 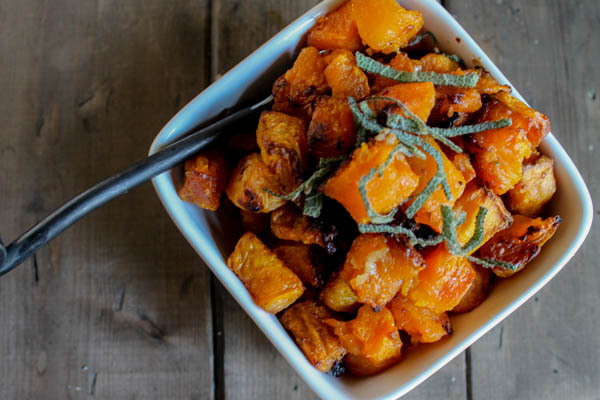 These caramelized and tender cubes make for a delicious Paleo butternut squash recipe to enjoy throughout the cooler months! 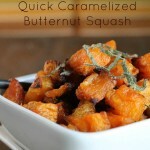 This is easily one of my very favorite ways to enjoy butternut squash. It is so simple to throw together, and I can easily polish off a whole squash all to myself when it is prepared this way….addicting! It is especially simple if you can find the fresh pre-peeled and cubed squash….I find mine at Costco in the produce section in season sometimes. I almost hesitate to call this a recipe…but I know how my brain works…sometimes I need to to SEE something to trigger what I already know. play around with the fats for different flavors. Coconut oil, avocado oil, and ghee are great options. add some fresh herbs in at the end….or infuse your cooking oil over low heat with the herbs before you toss it with the squash cubes. Sage is one of my favorites. like it sweeter? Add some maple syrup. But wait to do this until halfway through cooking time so the sugar does not burn. Need it quicker? Cut the cubes smaller! The squash will be tender at around 30 minutes. If you enjoy your squash like this, then by all means, enjoy! I like to leave it roasting for another 15-30 minutes to get the cubes nice and golden and caramelized. Click here to see all my recipes that include pumpkin or squash!! 2 pounds butternut squash 1" cubes, about one average sized squash. See below on how to peel and cube your own. Toss your squash with the fat, making sure to coat all your pieces well. Sprinkle with some sea salt and throw in a preheated oven. After about 25/30 minutes, use a sturdy spatula to scrape and toss the pieces for more even browning. When cubes are evenly golden and slightly chewy, you're ready!! They look so golden delicious. I especially love that slightly crispy outer, too. YUM! This was absolutely delicious!! It was easy and our whole family loved it – even our little boy with autism who can be somewhat of a picky eater. Absolutely delicious and easy as could be! Loooove butternut squash! This caramelized version sounds perfect! I LOVE winter squash. The caramelized edges have me drooling over here. Holy moly, that looks perfect! I can see how caramelized and flavorful those squash pieces are. 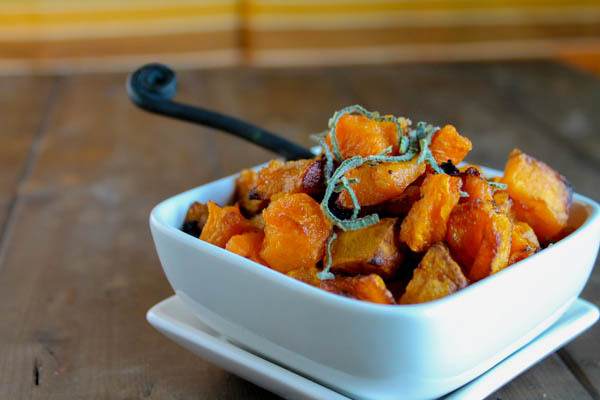 Definitely a winning Fall side dish! We make this just about every week at our house – my girls are obsessed and it makes a great side dish for everyone and I love to eat it with breakfast! I love how simple, healthy and delicious this is Tessa- plus pretty pics! This looks like CANDY! I would eat it on ice cream. Lovely. One of my favorite squashes!!! I just love butternut squash and this recipe looks like a winner! Pinned! Such a beautiful and simple recipe. Perfect for Thanksgiving! This squash looks simply amazing! I love how simply yet easy the recipe is! Perfect for thanksgiving! Nice. The best diet I ever tried is Paleo. 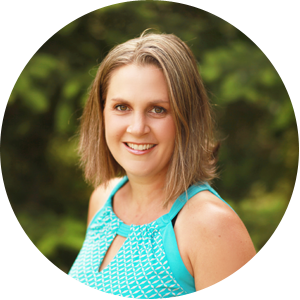 Lost weight, and feel much better and healthier.